Avro Vulcan XH558 was the last Vulcan to leave RAF service flying from 1986 to 1993. 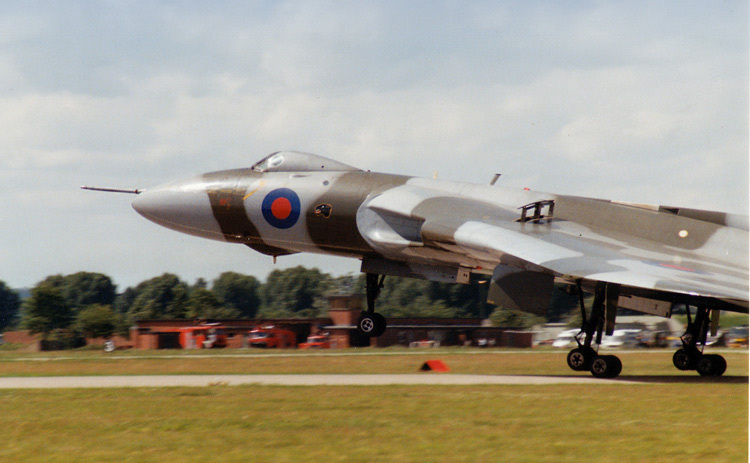 Vulcans established a world record at the time for the longest-ever bombing mission in the Falklands War: a return journey of nearly 8000 miles taking 15 hrs 45 minutes – seen here at the 1982 Church Fenton SSAFA Airshow. 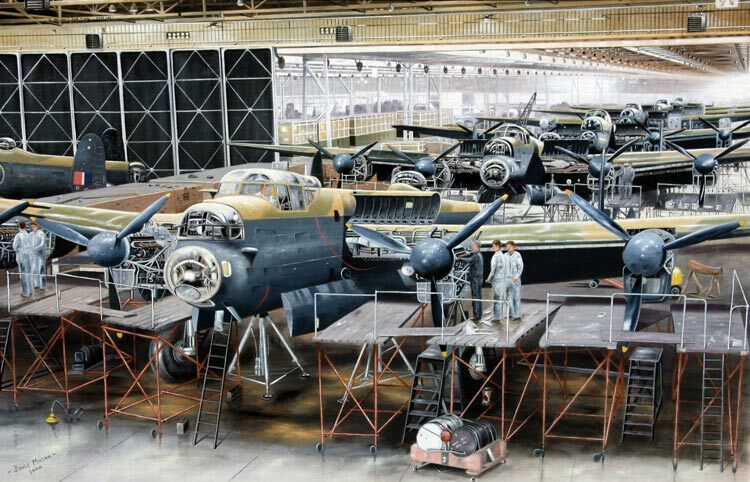 Avro Lancaster painting – Woodford 1941. Of the 7,377 built only 17 surviving and largely intact Lancasters are known to exist two are airworthy; one, based at RAF Coningsby is operated by ‘The Battle of Britain Memorial Flight’ and the other is in Canada, operated by the ‘Canadian Warplane Heritage Museum’. 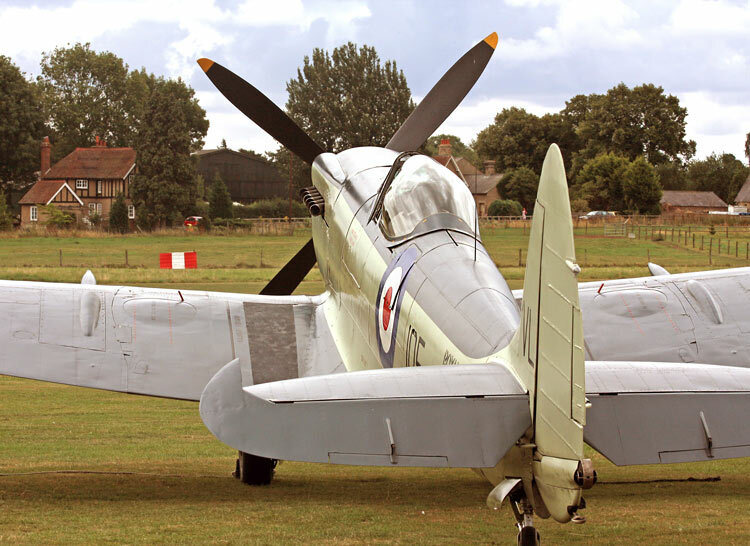 Supermarine Seafire Mk.17 – Shuttleworth Military Pageant. 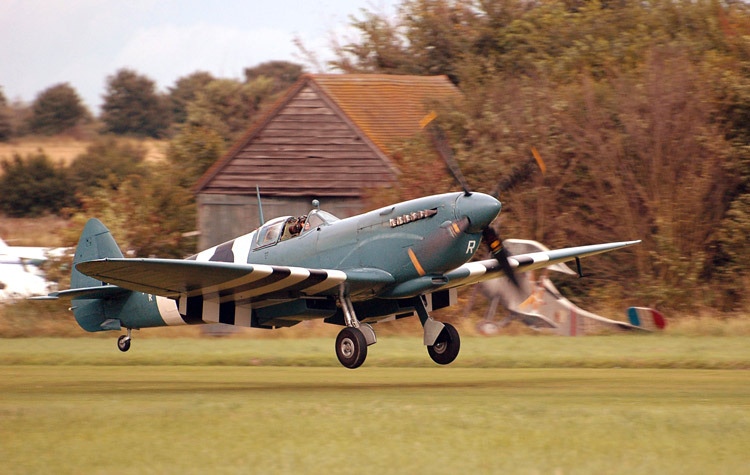 One of only 2 Griffon engined Seafires left in the world. 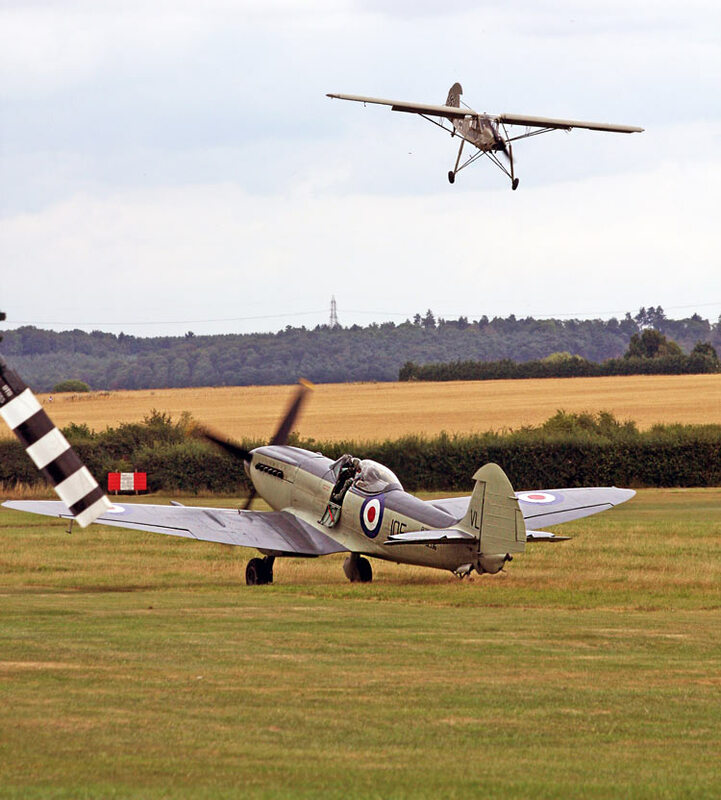 Peter Teichman of ‘The Hangar 11 Collection’ exits Supermarine Spitfire PR Mk XI PL965 a PR Mk XI photo reconnaissance aircraft – an extremely rare and unusual example of a Spitfire. 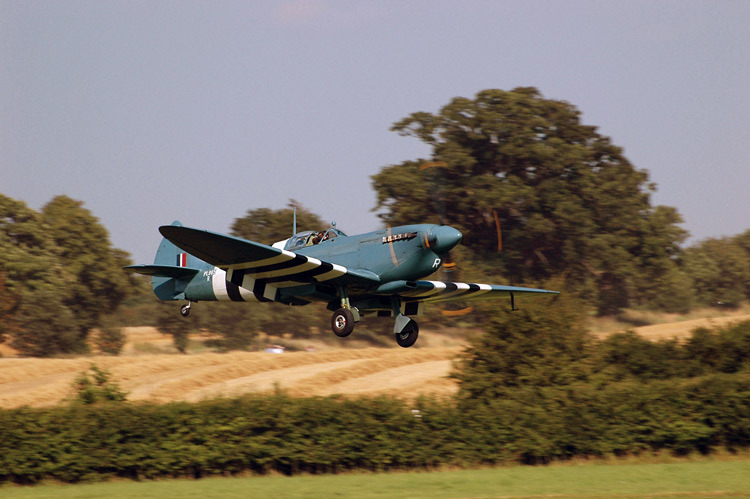 The PRU blue painted Spitfires operated at low and high altitudes, always flying alone. 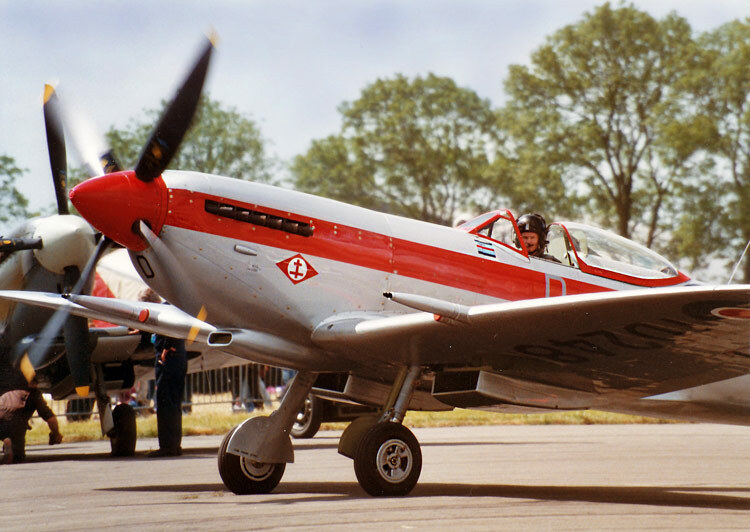 On the 10th July 1947 she was “retired” and sold for the princely sum of £25.0s.0d to the Royal Netherlands Air Force. 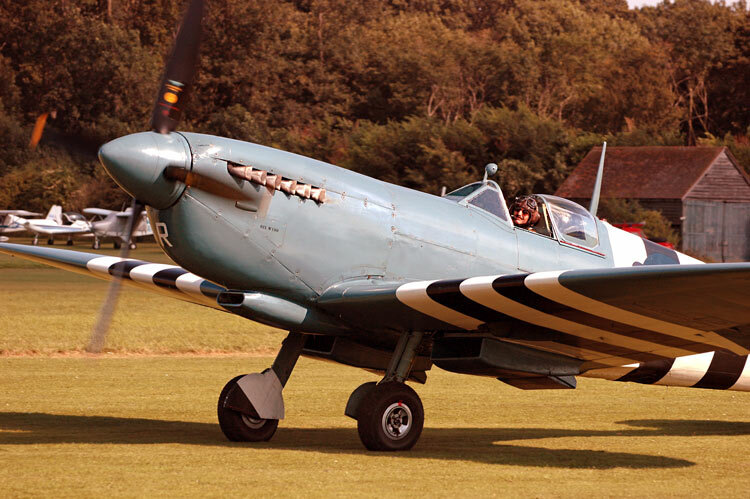 In 1939, a Spitfire cost £12,604 now it’s something like £1-£1.3m purchase price and £2500 per flying hour. 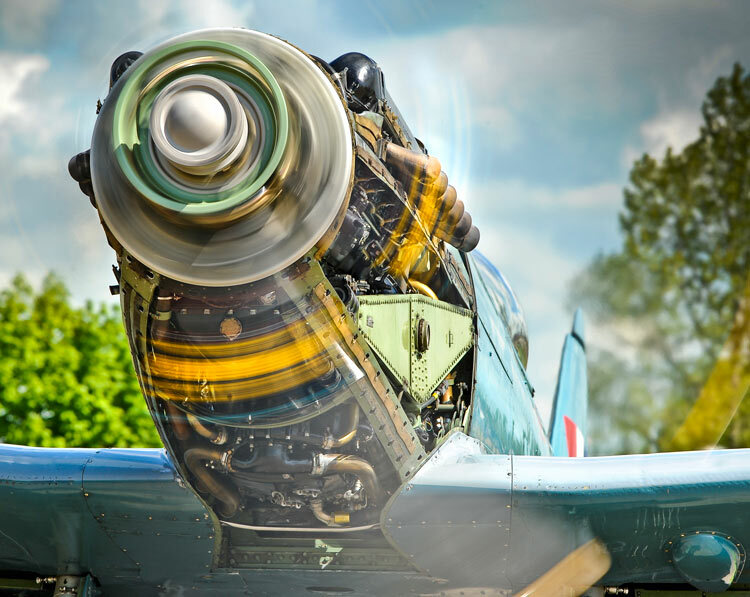 Spitfire PR Mk XIs were capable of a top speed of 417 mph at 24,000 ft. and could cruise at 395 mph at 32,000 ft. 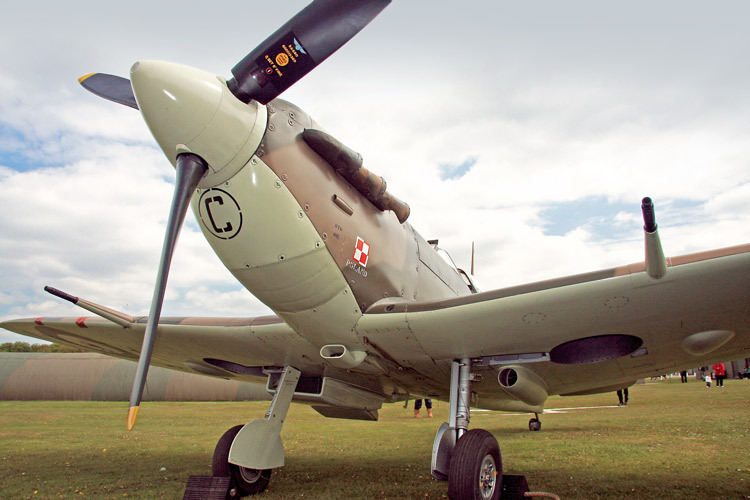 Built at Castle Bromwich and delivered on 26th April 1942, serving with 315 and 317 (Polish) Squadrons. Its final operational allocation was to No. 58 OTU before being retired from the RAF on 16th October 1945. 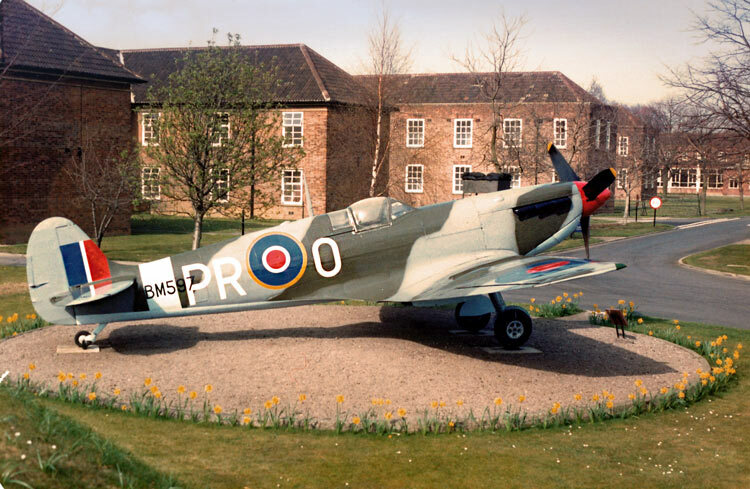 The aircraft became a gate guardian at RAF Church Fenton 1969-1988 and was even used to make moulds for the fibreglass replicas used in the filming of ‘Battle of Britain’. 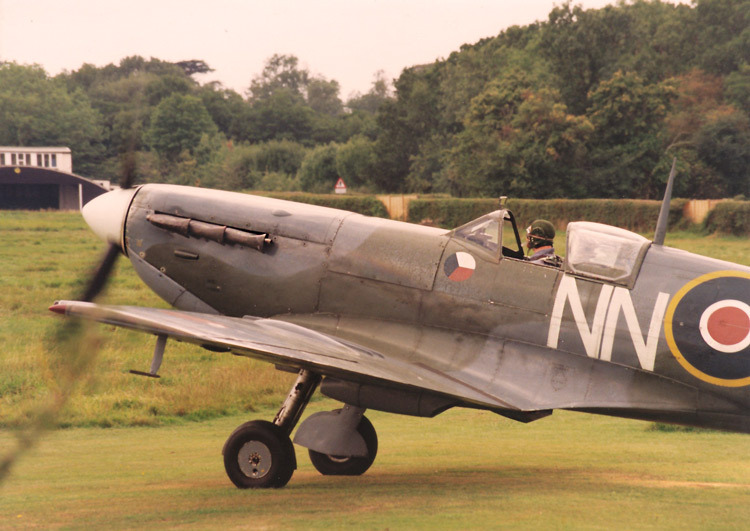 Used as static airframe in the film ‘Battle of Britain’ 1968. 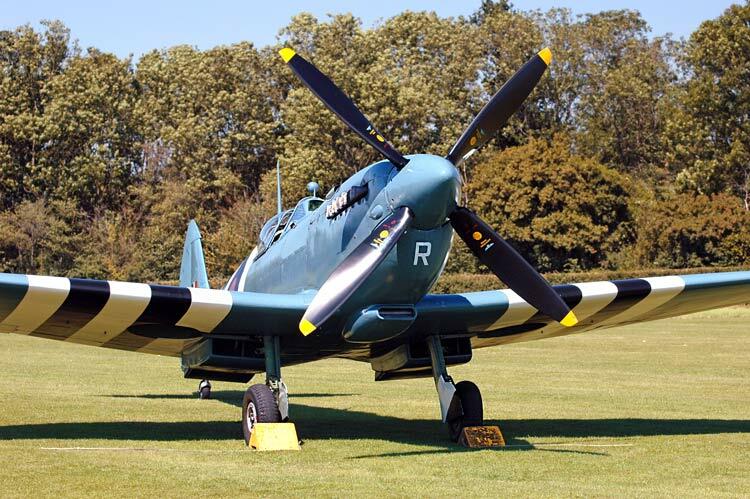 Acquired by Historic Aircraft Collection it was restored to its original specification and flies in the colours of 317 Squadron. 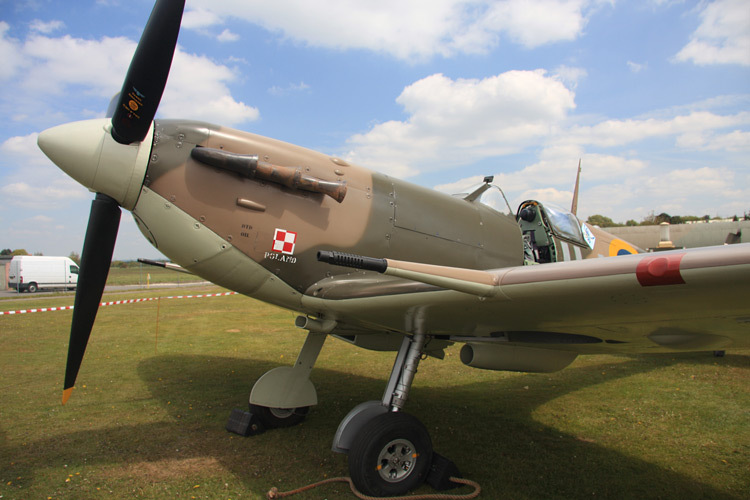 During the ‘Battle of Britain’ Polish Pilots shot down 203 Luftwaffe aircraft which stood for 12% of total German losses in the battle. 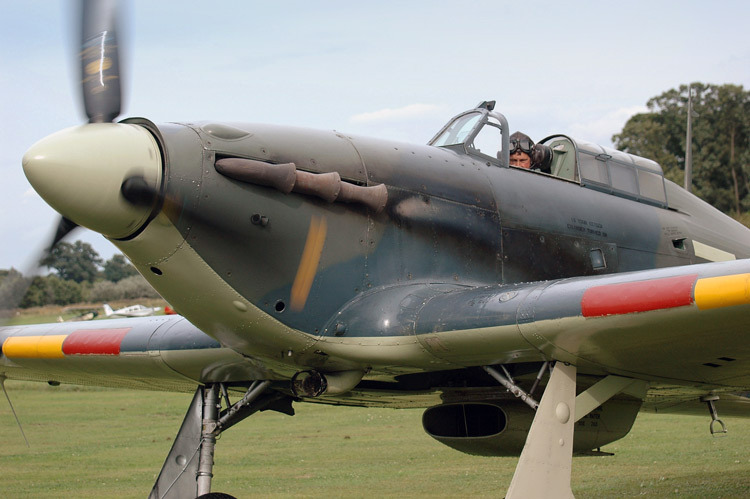 Spitfire ‘b’ wing – This was the A type modified to hold one 20mm Hispano cannon – The ‘b’ wing entered service during 1940 with No.19 Squadron who used it during the ‘Battle of Britain’, but the cannons were still causing problems. 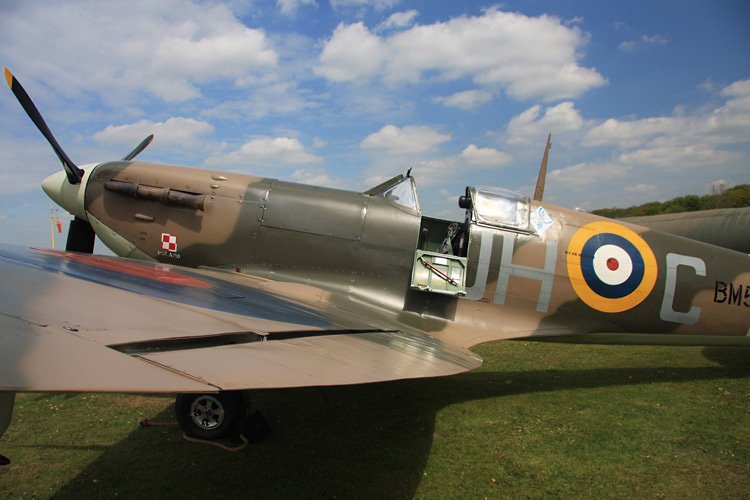 Finally in November 1940 No.92 Squadron received Spitfires equipped with two 20mm cannon and four 0.303in machine guns. 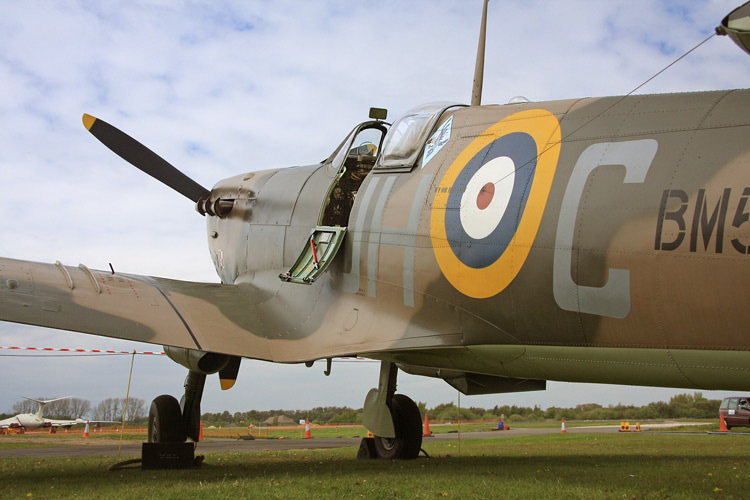 This proved to be a much more successful combination of weapons, and became the standard for the ‘b’wing. 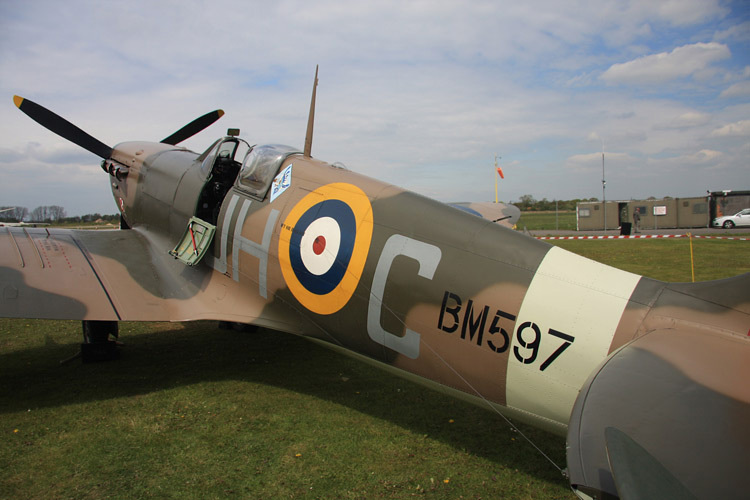 In 2005 it flew to Malta for the ‘Merlins Over Malta’ project while wearing a special temporary blue colour scheme to represent Malta based Spitfires. 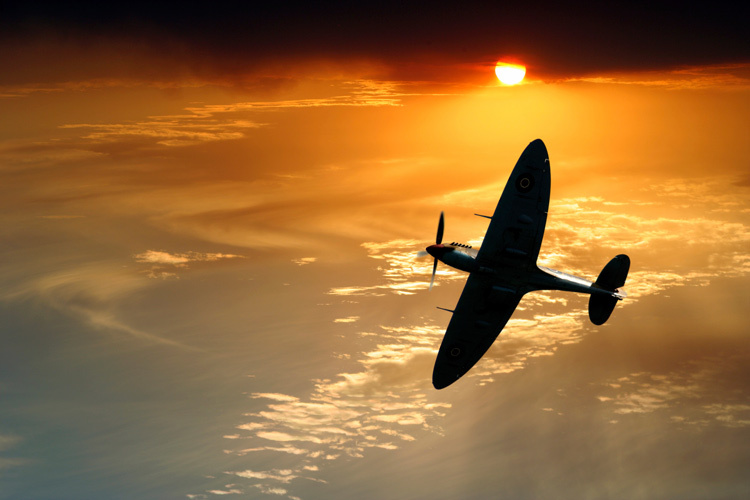 It was the first Spitfire to fly over Malta since the filming of ‘Malta Story’ in 1952. The character of “Peter Ross”, played by Alec Guiness, is apparently loosely based on that of Adrian Warburton who became legendary in the RAF for his role in the defence of the island. 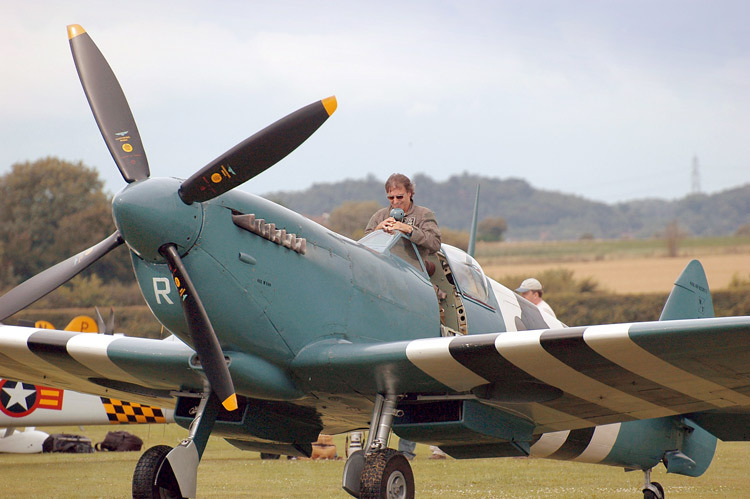 Renowned Spitfire display pilot and RAF Instructor Charlie Brown. Flt. 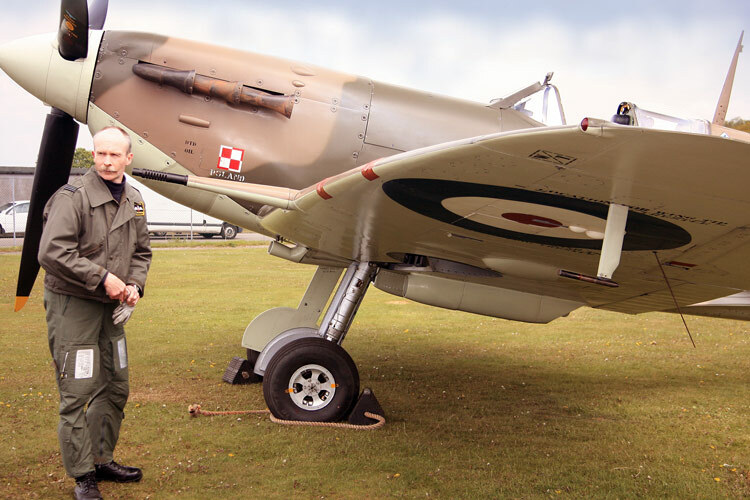 Lt. Brown joined the RAF in 1981 and in his 30 year flying career as an RAF pilot has flown Jet Provosts, Tornados, Chipmunks, Bulldogs, Tucanos and Tutors. 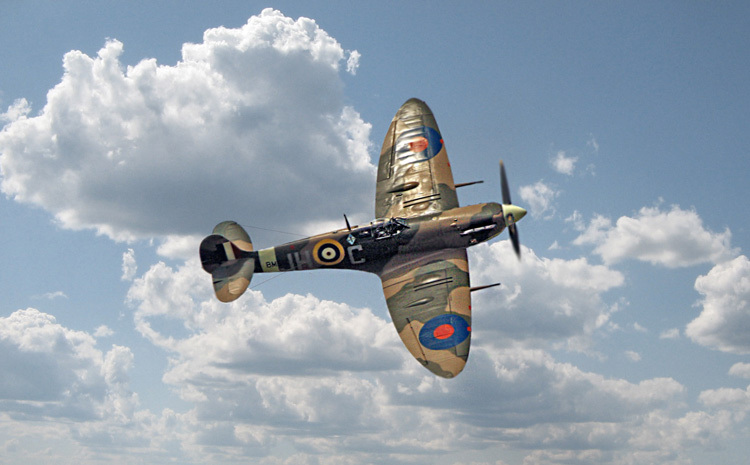 The Supermarine Spitfire was the only Allied fighter aircraft of the Second World War to fight in front line service, from the beginnings of the conflict, in September 1939, through to the end in August 1945. 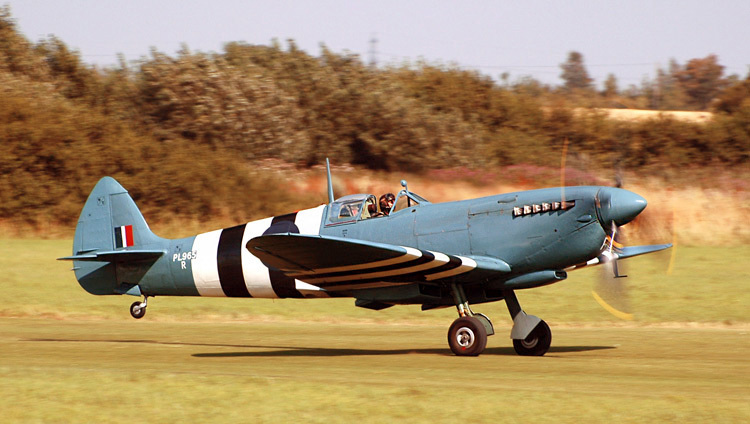 Departing Elvington – The Spitfire was built in many variants, using several wing configurations, and was produced in greater numbers than any other British aircraft. 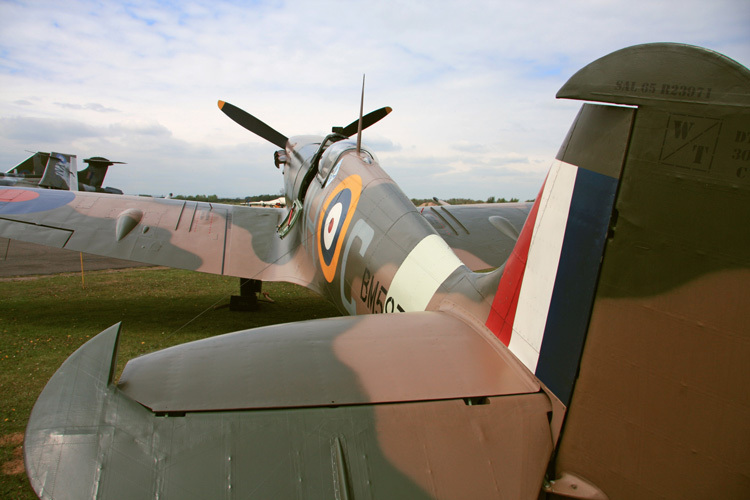 The Spitfire’s distinctive elliptical wing was designed to have the narrowest possible cross-section. 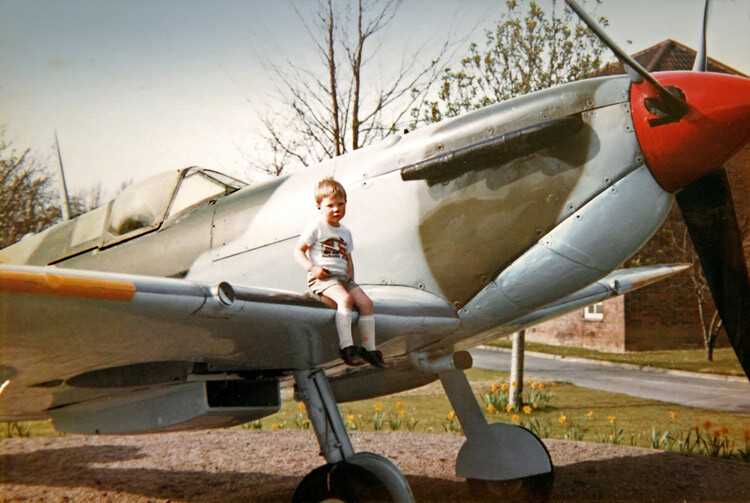 BM597 gate guardian at RAF Church Fenton – it also spent four years at RAF Linton-on-Ouse from 1975-79. A comprehensive history of this particular aircraft together with many images appears in ‘Fighting’ Church Fenton. 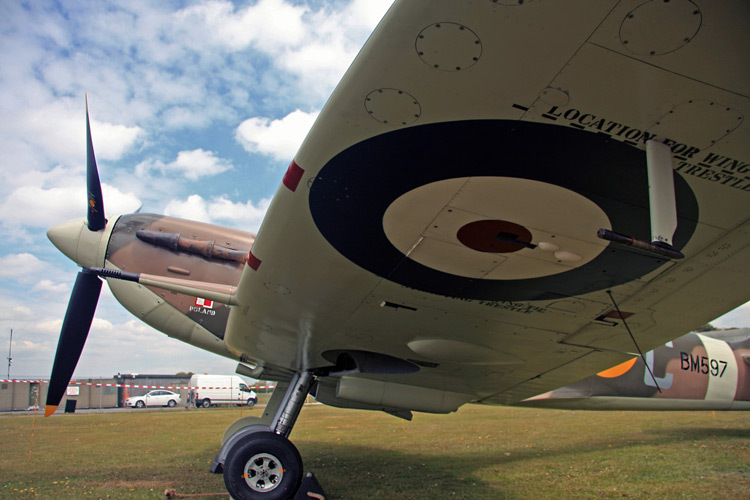 Spitfire LF Mk. XVIe built at Castle Bromwich and delivered to RAF as TD248, May 11, 1945. 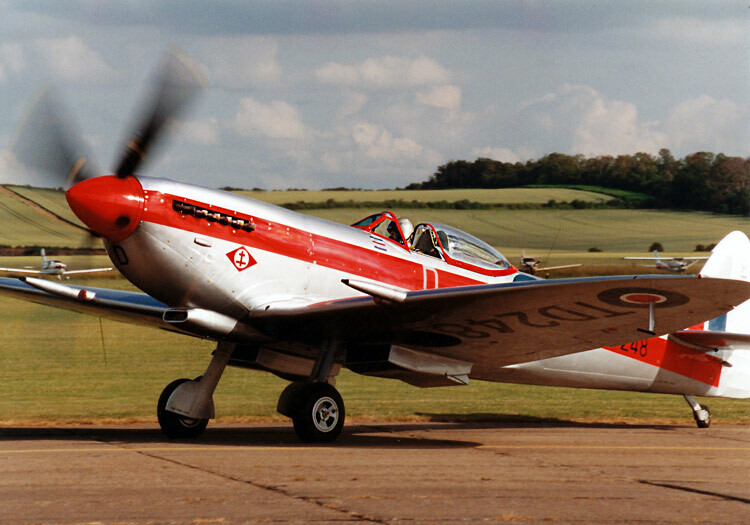 Photographed at Duxford ‘Flying Legends’ airshow in the striking silver and red livery of 41 Squadron that participated in the Blackpool Air races of 1948/49. 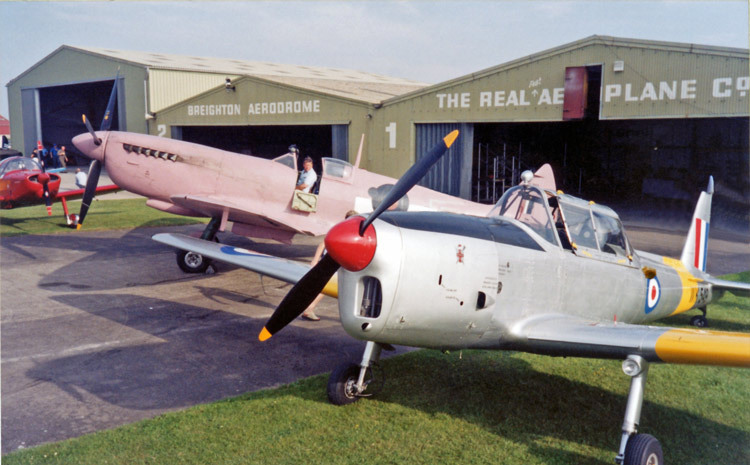 Sold in 2005 and the new owners had it re-sprayed in its present colour scheme of 74 Squadron 2nd Tactical Air Force May 1945. 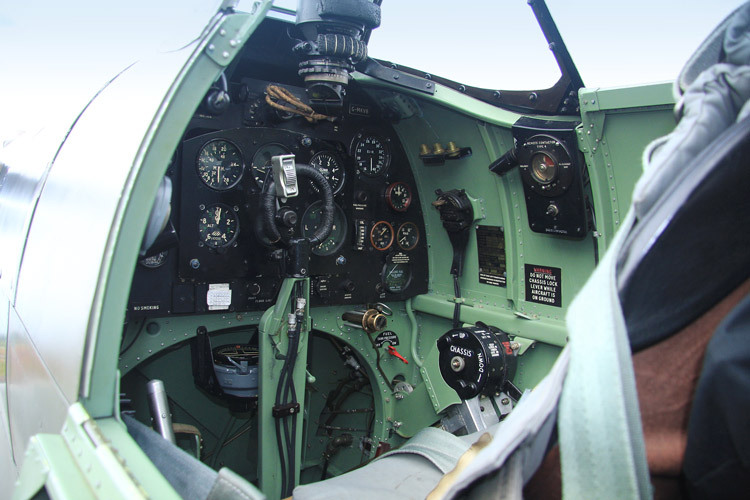 William Walton’s ‘Spitfire Prelude and Fugue’ here – uplifting and melancholic in remembrance of those often so very young pilots who never made it back to base. 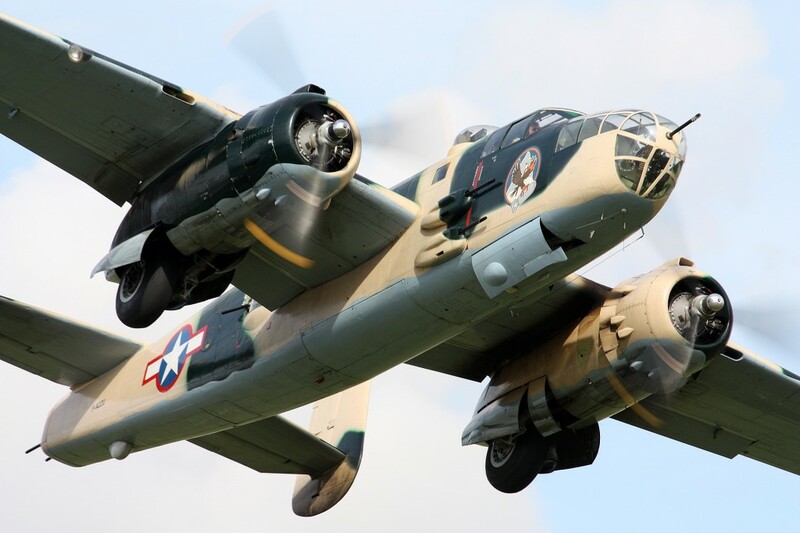 The B25 Mitchell seen over Duxford 2009. 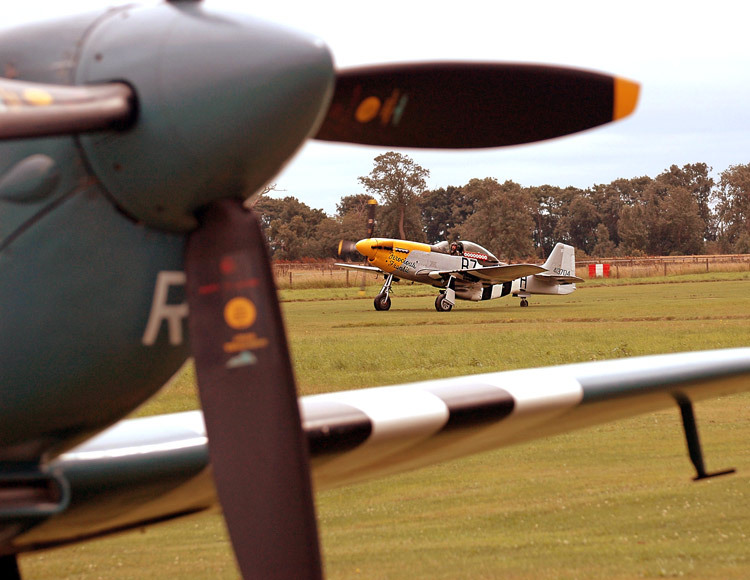 Used by many Allied air forces, in every theater of World War II, named in honour of General Billy Mitchell, a pioneer of U.S. military aviation. Photograph taken by Andrew Mason.